Ive tried a ton - and if I give 4 capsules of Arthroplex to my labradors theyre MUCH more active and "happy" looking during play. I really love Thorne Research and their products. Arthroplex (for Dogs and Cats) is no different. Works well for my chihuahua who has problems with his knees. I started giving this to my golden retriever about a month ago, and I can definitely can see positive changes. She has more mobility and energy. Definitely worth buying! 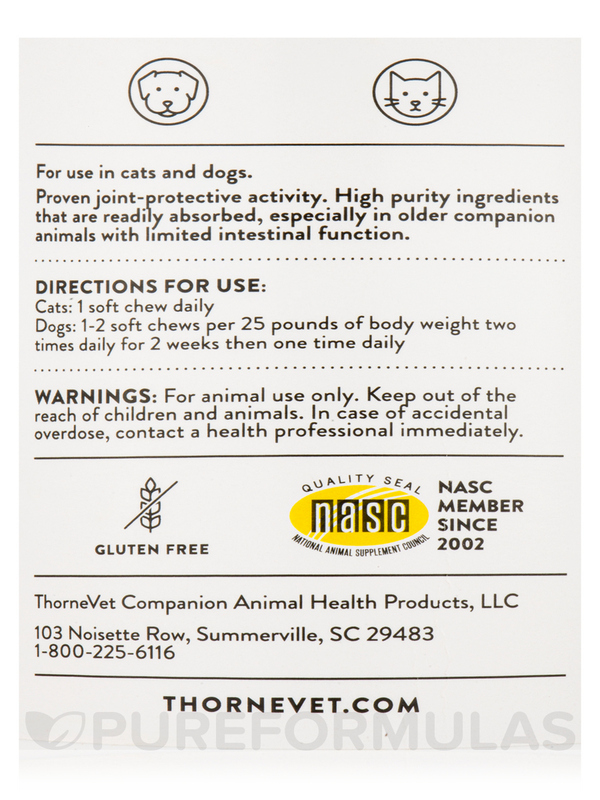 Arthroplex helps cats and dogs maintain healthy joint mobility. It also relieves occasional soreness and stiffness and supports healthy cartilage. Although there are many joint health products available on the animal health market‚ it is extremely important to have high-purity ingredients that are readily absorbed‚ especially in an older companion animal with limited intestinal function. 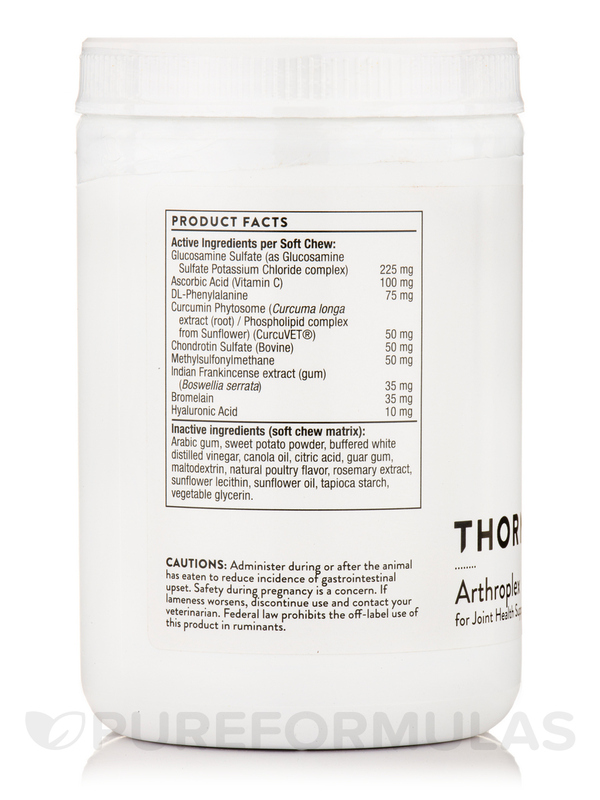 The unique‚ high-purity ingredients in ThorneVET's Arthroplex meet both criteria. 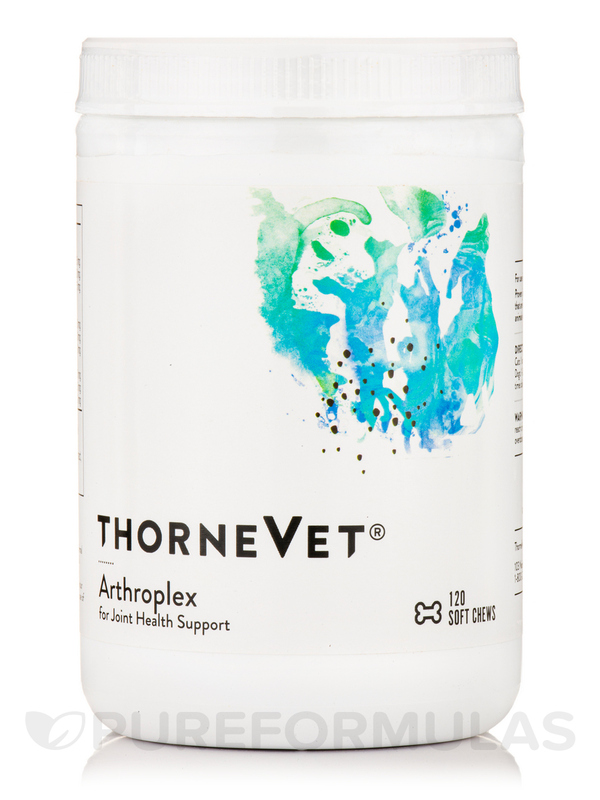 Arthroplex combines the proven joint protective activity of glucosamine sulfate with other cartilage-supportive ingredients‚ including the botanicals Boswellia and curcumin. Boswellia's efficacy works by inhibiting the activity of lipoxygenase enzymes‚ thus down-regulating pro-inflammatory reactions in the joints. The curcumin in Arthroplex supports a healthy inflammatory response in the joints‚ and is the same well-absorbed curcumin phytosome found in CurcuVET®. Bromelain – a protein-digesting enzyme complex from pineapple – stimulates fibrinolytic activity and inhibits thromboxane A2‚ which helps to down-regulate pro-inflammatory cytokines and prostaglandins. A recent in vivo study examined a Boswellia extract for its effect on glycosaminoglycan metabolism. Glycosaminoglycans form an important component of connective tissues in a companion animal's body. It was found that the Boswellia extract significantly reduced the degradation of glycosaminoglycans (GAGs) compared to controls. Evidence indicates that bromelain's action is in part attributable to its ability to inhibit the generation of bradykinin via depletion of the plasma kallikrein system. DL-Phenylalanine‚ another ingredient of Arthroplex‚ is a component of the catecholamine neurotransmitter cascade. Supplementation can lead to increased levels of the neurotransmitters norepinephrine and dopamine‚ which can in turn increase levels of endorphins and enkephalins. The curcumin in Arthroplex is the same well-absorbed curcumin phytosome found in another ThorneVET product‚ CurcuVET®. Like Boswellia‚ curcumin helps support a healthy inflammatory response in the animal's joints. Other Ingredients: Microcrystalline Cellulose‚ Hypromellose (derived from cellulose) capsule‚ Calcium Laurate‚ Silicon Dioxide. Dogs: 1-2 capsules per 25 lbs. of body weight two times daily for 2 weeks then one time daily. I introduced a low dose of Arthroplex by Thorne Research to my dog at first. I still haven't given a full dose to my 60 lb dog. In four days, my dog started having seizures. Not knowing if the product was causing the seizures, I stopped for two weeks. Then I restarted at a low dose again for three days and then gave half of a dose yesterday evening and my dog has had three seizure starting from the middle of the night. Afraid to use it again. My dog has no history of seizures. My 2 dogs are 7 yr old outdoor dogs & I want to protect them as much as possible from joint problems. My male hasnt exhibited as much limping or general discomfort since I began using Arthroplex earlier this year. My female is very hyper & doesnt show joint problems but Im hoping Arthroplex will protect her from developing any. Noticeable improvement in male dog condition. Inconvenient powder capsules. I have to open them & mix with wet dog food. If they are hidden in the dog food as a whole capsule the dogs manage to avoid them. Our retired vet recommended Arthoplex for one of our aging retrievers (goldens labradors and flat coats) and we now put them all on Arthoplex at around one year of age at a lower dosage. At age 5 to 7 we increase the dosage and have healthy joints in them all. 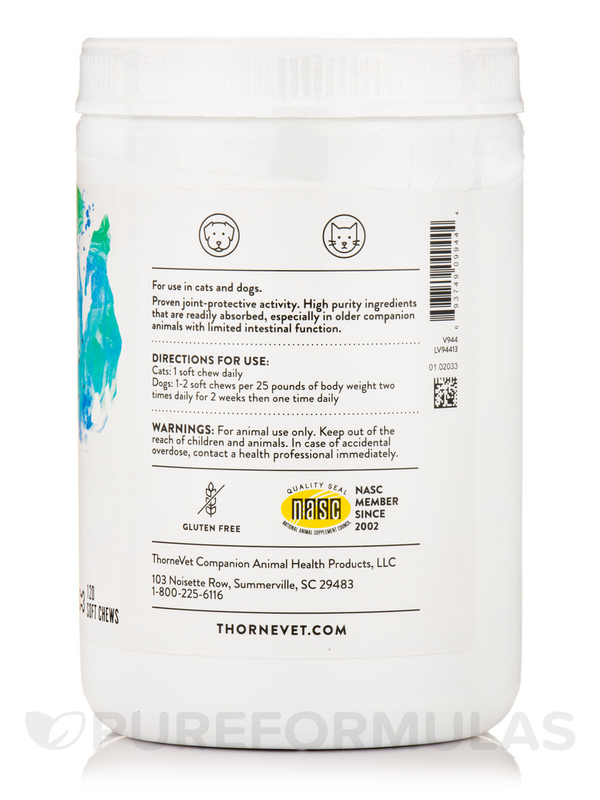 I buy Arthoplex at PureFormulas because it is the best price I have found and always get free shipping which makes it hard for vets to beat the price. Recommended by a vet. Assured quality by reputable lab Thorne. Works great! 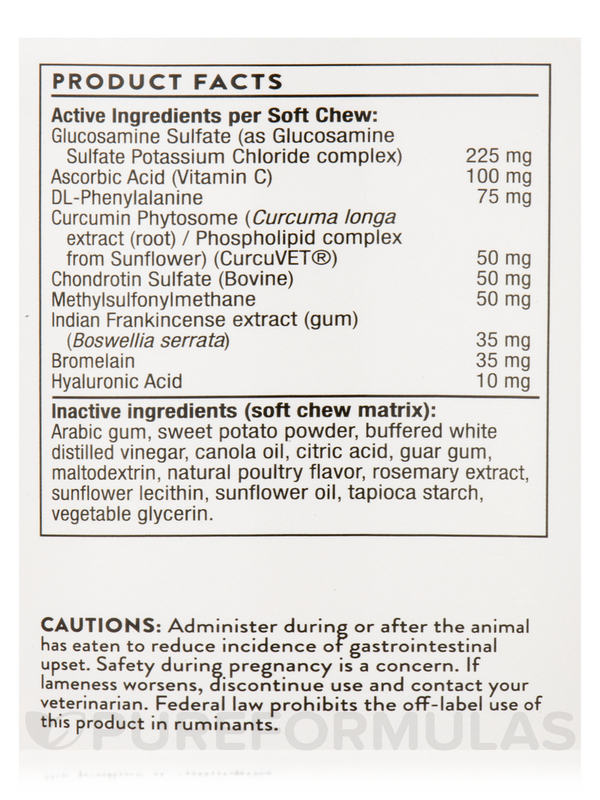 I did a lot of research for supplements to help my 8 year old chow mix with her arthritis pain in her hips. After a week on Arthroplex she is already able to jump onto the couch without a problem which she was unable to do a week ago. So far so good!! I did a lot of research before ordering Arthroplex (for Dogs and Cats) for my 13 year old dog with arthritis. She is on Metacam but I wanted to add a supplement as well. It is too early to tell but I am keeping my fingers crosssed that it helps her. Pure Formulas is the best! My 9-year old sheltie developed painful arthritis in his leg. Vet gave me rimadyl which caused vomiting. Besides the side effect of the drug were really frightening.. I tried a natural yucca extract which hasnt helped. Arthroplex by Thorne Research started working within a week. He no longer has the obviously painful joint. I am so relieved to find a natural solution for my best friend. Thank you! Its natural with no dangerous side effects. Its powder and I only need to open the capsules and put it in his food and he doesnt mind the taste. One of our cats Moses has a spinal deformity which has created a lot of arthritis in his spine. This has made life difficult for him as his range of motion is severely limited. Hes also prone to muscle spasms and slipped discs because of this. We have tried various brands of joint supplements over the years with him with no noticeable improvement. Acupuncture helps but after a few weeks he starts to struggle again. Now that hes been on Arthroplex by Thorne Research for the last year he has a vast improvement in his ROM and his overall quality of life. Were even able to further space out his acupuncture treatments! Best of all now that hes not in so much pain his personality has changed for the better. Tasteless and odorless powder so the cat doesnt know its mixed in his food. Hello, thank you for contacting PureFormulas. Please contact your vet before giving this to your dog.